Wilton residents on Tuesday night came out in strong opposition to Central Maine Power’s proposed transmission project. 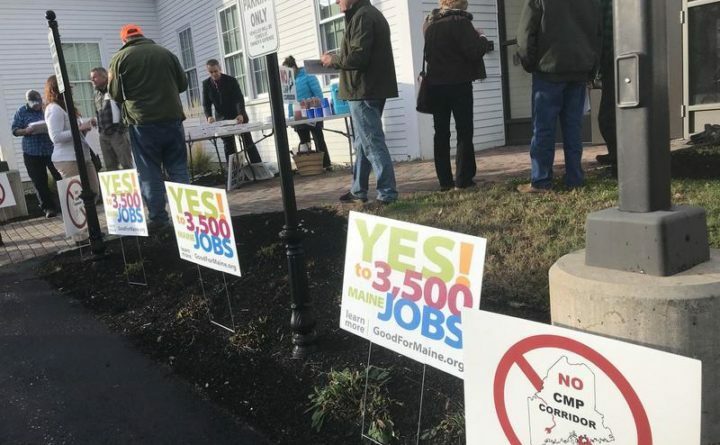 More than 200 residents voted nearly unanimously at a special town meeting to rescind the Select Board’s letter supporting the New England Clean Energy Connect project and directed the board to issue a statement opposing it, according to the Franklin Journal. It was the first vote related to the project since Central Maine Power unveiled a benefit package meant to win over skeptics. The $1 billion transmission project would bring Canadian hydro power to customers in Massachusetts. That project includes 53 new miles of corridor and upgrades to existing power lines running through western Maine, where opposition among residents is strong. Gov. Janet Mills, a Democrat, was initially skeptical of the project during the 2018 gubernatorial race, but came out in support of it late last month after Central Maine Power offered a package of benefits to Maine, including a $50 million low-income customer benefits fund, a $140 million rate relief fund, a $10 million broadband fund, a $15 million heat pump fund and $10 million from Hydro-Quebec for electric vehicles. Residents who spoke in opposition to the project said Mainers are getting “absolutely nothing” in exchange, while selectmen pointed to the $258 million package meant to benefit the state over the next 40 years, the Journal reports.